Soft and delicate, your baby’s supple skin is designed to play a highly important role—it allows your baby to experience the joy of a parent’s hug, as well as the protection from less desirable outside elements, such as the contents of dirty diapers. However, continued exposure to the moisture and irritants within a baby’s diaper can inevitably lead to a mild to severe case of diaper rash, which can be incredibly painful and uncomfortable. That’s where Triple Paste® comes in. Triple Paste, the premium ointment for treating diaper rash, was specially formulated to quickly relieve the raw, irritated skin caused by diaper rash, therefore calming and soothing your little one. In addition, Triple Paste’s superior, long-lasting barrier formula stays put, keeping the medication where it needs to be and diaper rash irritants out. 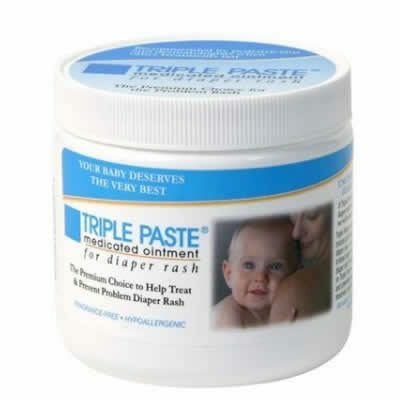 Triple Paste allows for fast healing of diaper rash as well as continued relief and prevention. Directions: Clean affected area and dry thoroughly. Apply a thin layer of product over affected area twice daily (morning and night) or as directed by a doctor. Supervise children in the use of this product. Use daily for 2 weeks; If condition persists longer, consult a doctor. This product is not effective on the scalp or nails. 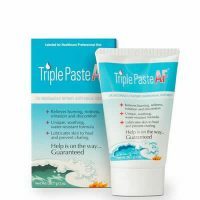 Use Triple Paste AF when… Typical creams, powders and sprays have failed. Excess moisture or perspiration is present. Skin rubbing against skin is causing redness. Your doctor recommends it. zinc oxide, white petrolatum, corn starch, anhydrous lanolin, stearyl alcohol, beeswax, bisabolol, cholesterol, water, glycerine, oat (avena sativa) kernel extract, polysorbate 80. Triple Paste is fragrance-free, hypo-allergenic, and contains no preservatives.